One interesting company that seems to have had a "second life" is Microsoft. Between the new Surface Book and other innovations, it seems to be on all cylinders. Microsoft needed a hit with Windows 10, and it looks like it's got one. According to statistics from NetMarketShare, compiled here by Statista, Windows 10 is now on 6.6% of all desktop computers accessing the web. 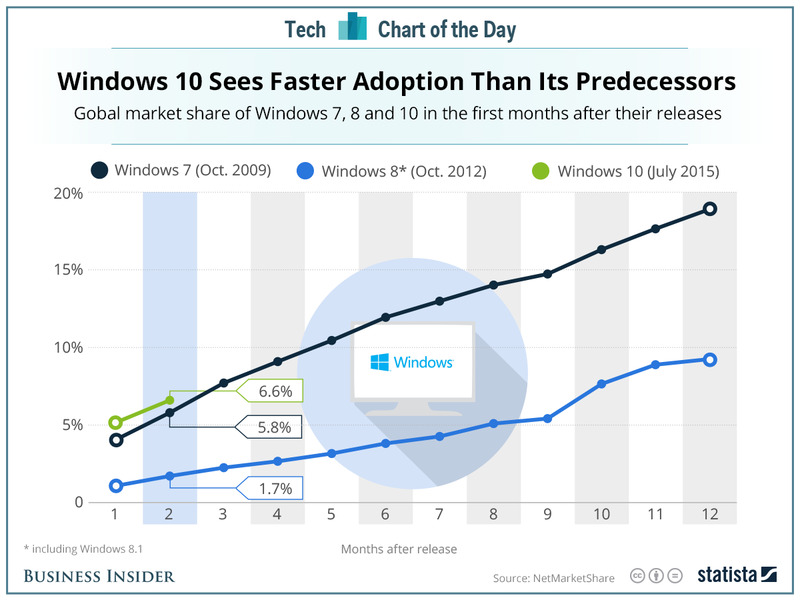 Not surprisingly, that's a lot faster adoption than Windows 8, which was poorly received. The Tweet of the Day yesterday came from Chris Dixon of Andreessen Horowitz, who asked: "Someone please explain why HP is splitting up while Dell and EMC are merging despite the fact they are in exactly the same business?" "This is a real opportunity for HP. Two of our largest competitors are attempting a highly distracting, multi-year merger, just as we are launching two new, focused companies. The massive debt burden Dell and EMC are taking on undoubtedly means that they will have to radically reduce R&D, and integration inevitably will create disruption as they rationalize product portfolios, channel programs and leadership." That's strong stuff. But there are clearly two sides to this debate. HP's split is partly to satisfy public investors who like focused investments - something privately-owned Dell won't have to worry about. A question for Whitman: would HP have split if it had had a private option? Worth noting that when we asked Fortune 500 CEOs earlier this year whether their company would be easier to manage if it were private,84% said "yes." Meanwhile, Joe Tucci's exit from EMC will come with a big paycheck. Equilar calculates that the company's change of control provisions mean Tucci could walk away with $27.2 million. Enjoy the day. I'll be spending it with Fortune's Most Powerful Women in Washington, where I'll ask another big tech competitor, IBM CEO Ginni Rometty, what she makes of the Dell deal.